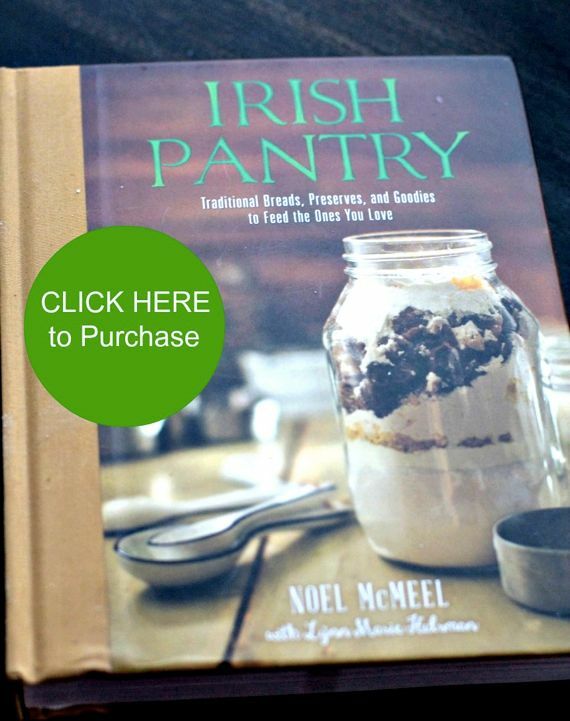 Last year I received this copy of the Irish Pantry, by Noel McMeel and the first thing I made was Irish Soda Bread. Of all the cookbooks I get sent to take a peak at, Irish Pantry by Noel McMeel has hit my soul most deeply. His book is invigorating, which is not a typical cookbook description. His passion for the home kitchen and his childhood memories of cooking in his Irish homeland resonates with how I feel about the relationship of food and family. I’m not Irish, but I can’t put this book away. It’s beautiful or should I say handsome. The cover is warmly colored and is bound in such a way that it feels hearty. The photography is simply stunning. A lot of talent and effort has gone into the cookbook, Irish Pantry. The book doesn’t have many recipes I’m familiar with which made me love even more. Irish Pantry is mainly focused on traditional breads, preserves, condiments, and some sweets, and lots of recipes that make delightful food gifts. I know very little about Irish food, except for Irish cream and soda bread, and dreamy Irish butter. I was captivated with the stories of Noel’s growing up in Ireland and talking about having lots of homemade shortbread, which was considered a staple in his home growing up. They often sent guests home with food gifts, jams, chutneys and probably shortbread. 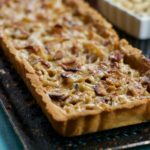 The book is filled with recipes calling for Irish butter like Buttery salted caramel sauce and Savory Whiskey Butter with Shallots and Kosher Salt, as well as lots of recipes for breads, like the family Barm Brack, which I”m sure when slathered with Irish butter makes all dreams come true. I am also drawn to the recipes for spicy lemon confit, homemade Irish cream, blue cheese pecan crackers. I don’t think there’s another cookbook that addresses simple farm food in this elegant, earthy manner. 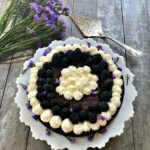 You not only fall in love with the food, and the photography, Noel’s voice comes through and you know you would feel comfortable sitting at the table with him, eating a simple Irish soda bread with a homemade preserve. 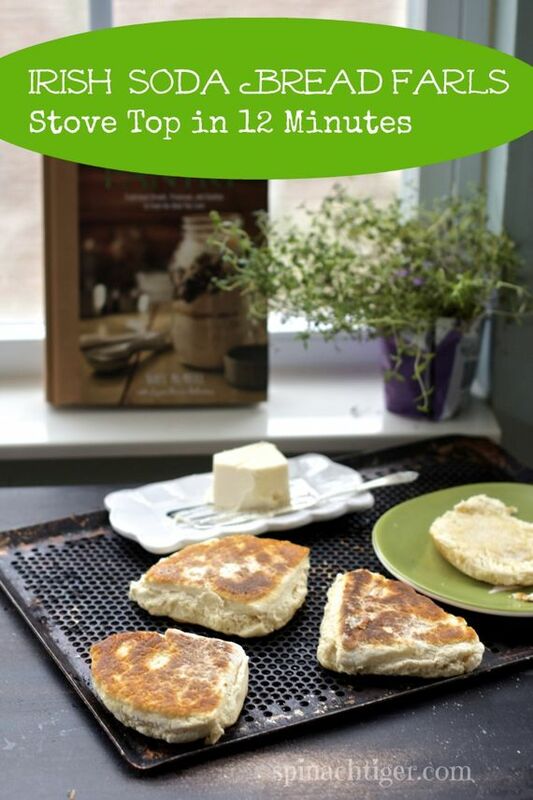 I’ve chosen probably the most simple recipe in Irish Pantry, traditional soda bread, because it’s an Irish staple and this recipe is make on top of the stove in a cast iron pan, looking back to the 18th century, a time when only the wealthy had ovens. Dairy was typically plentiful, and the Irish wheat was soft. The introduction of baking soda gave the common home cook the ability to bake on top of the stove. I made sure I used White Lily Soft winter wheat flour. It does make the difference in keeping the soda bread light and more authentic. Soda bread only takes between 12 and 16 minutes to cook and a few minutes to prep, only there is no fat in dough and they are denser. It’s mainly flour, buttermilk and baking soda. 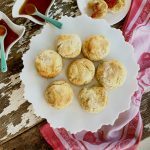 The smell of the dough reminded me of Southern biscuits, only the flour is heavier and there is no fat in the dough. The texture is denser, and the outside crispy. It’s St. Patrick’s Day, and I felt like eating these was better than green beer. I made them into 4 pieces, the second time going more traditional, cutting into 4 triangles known as farls. Celebrate St. Patrick’s Day with Irish Soda Bread. Traditional Stove Top Irish Soda Bread. Mix flour, slat, cream of tartar, baking soda together in large bowl. Using a wooden spoon, pour buttermilk in center of flour and mix. Bring together to form sticky dough. Turn sticky dough onto heavily floured surface. Form dough into a ball, and flatten to about ½ inch. Either leave in one piece or cut into four quarters and make four round soda breads. Place just enough oil in pan to cover surface and cook on each side for 8 minutes on medium heat. Flour: You can use all purpose flour, but it will be heavier than traditional soda bread. If you can, choose a soft winter wheat like White Lily. We also have White Lily all purpose. You can use all purpose flour. Where I live anyway White Lily is self rising–are you using a self rising flour or do they have more than one kind of flour? 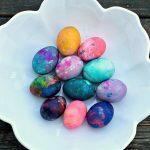 I love the idea of making these in a pan! I don’t do anything special for St. Patrick’s Day, however I have made Irish Soda Bread many years ago. Hi there! Every year we get our two daughters dressed in green and do to our town’s St. Patrick’s Day Parade. Afterwards I make homemade corned beef and cabbage and Irish Soda Bread. This year, though I am recovering from two unsuccessful surgeries- the first a brain surgery- for a very rare nerve disorder. I am in chronic pain and am quite ill. Sadly this year there was no cooking and mama missed the parade fun, but my girls went with their daddy and had fun. I subscribe and my email is: anewrue@yahoo.com. Thanks! I don’t celebrate St.Patrick’s Day.I’ve never made irish soda bread before. We celebrated by making corned beef and cabbage. I have never made Irish Soda Bread. I make Colcannon every year on St. Patrick’s Day and also corned beef. My son loves corned beef and my whole family love Colcannon. St. Patrick’s day is also my sister’s birthday and she loves Colcannon too so I always make extra for her. I have made soda bread before and just follow which ever recipe I decide to use. I make soda bread and a whole grain soda bread from king Arthur’s flour…it’s fabulous! For my soda bread REAL buttermilk is necessary. 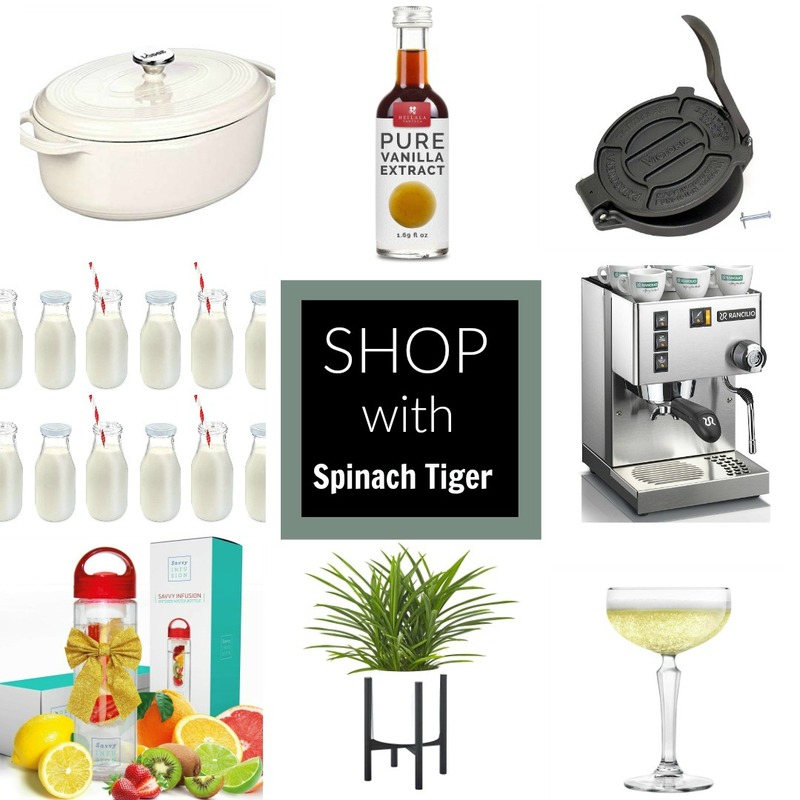 I subscribe to spinach tiger! Happy St. Patricks Day Angela! I made soda bread. It is easy and delisiouse. I haven’t made soda bread but will now be giving it a try. Any ideas for a gluten free version? I already subscribe 🙂 thanks for all you do, I love reading your blog! Thanks for sharing this, Angela. The bread looks divine! Happy St. Patrick’s Day to you! I always do a corned beef/cabbage/red potato dish in the crockpot with a bottle of Guinness. I’ve yet to attempt soda bread, though…my baking skills are sorely lacking. I’ve been subscribed to your newsletter for several months now. Thanks! Thanks, Tripp. The soda bread is actually easier than making corned beef and cabbage. Thanks. Sounds good especially fun to make those crafts. I spent it with my dad, every year he makes me corned beef, cabbage and boiled potatoes. I bring the Guinness and soda bread! Great day! What a Great St. Patrick’s Day tradition. I have never made Irish Soda Bread. We celebrate St. Patrick’s Day with a corned beef and cabbage recipe usually a few days before. Then yesterday, it was Reuben sandwiches and tonight it is corned beef hash. This year we were in a St. Patrick’s parade, and we made green fudge. Adrienne, Green fudge sound so fun. My second entry, email subscriber. Thanks! 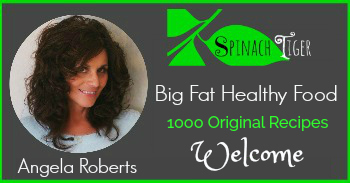 I’m one of your email subscribers! I am half Irish and have never made “real” Irish fare. I’ve never made this soda bread but after reading this post and the recipe I definitely will. It looks wonderful. I subscribe! I thought of another tip: place your irish soda bread dough on parchment paper if you’re putting it in the oven! I have made irish soda bread. I love that it is so easy to make! 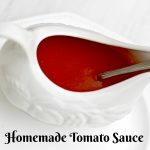 My recipe calls for white vinegar, but you can use apple cider vinegar as well. This cookbook looks fabulous! 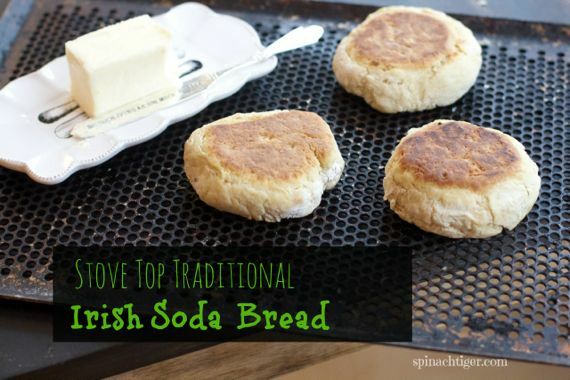 I have never made Irish Soda Bread, but I definitely want to after reading about it on this blog. 🙂 I celebrate St. Patrick’s Day by wearing green, of course, and today I might go searching for four-leaf clovers and later have potato soup and corned beef with an Irish-themed movie. I am already a subscriber to your blog. Thank you Heather. Good Luck. Denise. Thanks so much for you kind words. My husband will be right over for that pastrami! We celebrate our anniversary on St. Patrick’s Day! Today makes 14 years! <3 <3 I've never made Irish Soda Bread, but that recipe looks awesome, thank you!! Happy Anniversary Kristi. We are almost 15 years. Love your recipes and lately I have made Buttery Spaghetti with Peas and Bacon. YUM, YUM and YUM !!! I love making Soda Bread with our meal on St Patty’s Day. It is delish ! One of the things that I have learned is really not to handle it much. I know it says to knead it a few times, that is the trick, a few times. I have never made the stove top version just mainly baked it in the oven. We usually have Corned Beef or Shepherd’s Pie but it varies from year to year. I already subscribe to you ! Thanks Michelle. Yes, I treated it as gently as biscuit dough. Green is always a part of it. 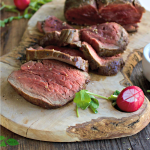 We do slow roasted corned beef. Roasted potatoes and sauteed cabbage. Libby, I was worried about that too. It puffed up and it was just nearly cooked. I’ve made soda bread many times, but have never published it on my blog! No nifty tips, but I do use King Arthur whole wheat flour to make it a little more filling. And always Kerrygold butter (which Trader Joe’s has for cheaper than anywhere else). I love that Kerrygold butter, Leslie. Over the weekend I made two different recipes of Irish Soda bread. The first was a new recipe and it included eggs. It turned out more like a coffee cake than anything. The second was more of what a traditional soda bread should be like. This was not the first time I have made soda bread. I have made it each year for the last few years. Maureen do you make it on top of the stove?